Repair Water Damaged Floor — If you are reading this article, then the worst case scenario has probably occurred; water damage to your floor. Moisture is a killer for wood and laminate flooring, but there are methods for water damage repairs that can be accomplished with a few tools and intermediate carpentry skills. Here you will find step-by-step instructions in order to repair a water damaged floor. Since wood and laminate floors are disproportionately affected by water damage, as opposed to other floorcovering materials, this article specifically focuses on these two types. Included are the steps to locate the area and extent of the damage, how to find and address the cause, and two different methods of removal of laminate and glue-down engineered wood flooring. Finally, this article concludes with the methods for drying the subfloor before re-installation. The very first step in repairing water damage to a floor is to determine the extent of the area that has been affected. Asides from the tell-tale visual markings of water damage, the swelling of planks and joint separation, it is best to acquire a moisture meter (consider renting or borrowing one, as they are quite expensive) and measure for the moisture content around the area. As a rule of thumb, anything above 5% is usually too much, but the requirements vary by manufacturer and the specific sub-surface. For example, Pergo requires moisture levels less than 4.5% for concrete and 14% for a wood subfloor. Another method is to use readings from an area as far away as possible from the site of the damage as a reference to what the normal moisture content is for the particular floor. However, be advised that in the case of large-scale water damage, the moisture can travel quite far, especially underneath a floating floor; within any one room, there may not be a single dry area with an acceptable moisture content. Once the damaged area has been determined, it is then necessary to isolate the cause of the damage. There are a number of things that can cause water damage to floors, and it is absolutely imperative to know where the water came from before any repairs take place. Improper cleaning methods: Using too much water when cleaning can ruin any wood or laminate floor. Leaky windows: Windows that are not sealed properly can allow a substantial amount of water to enter. The moisture content of the adjacent wall will likely also be high. Plumbing leaks: Any kind of plumbing leak will eventually find its way to the floor and subfloor if not addressed quickly. Pinhole leaks in pipes are especially difficult to find and are absolutely detrimental to surrounding areas. Sprinklers: Sprinklers that constantly spray an exterior wall may eventually cause water damage inside the home, especially in wood structures. Poor drainage: This is a serious problem, and will cause a concrete slab to soak up water. The pooling of water in areas in contact with the outside perimeter of a house indicates drainage problems. When the cause of the problem is found and addressed, then the actual repair work can be started. For laminate floor repairs, it is necessary to take apart an entire section of floor, starting from the closest wall parallel to the installation, all the way to the damaged portion. If there are rows of planks that do not need to be replaced, they can (and should) be re-used, unless they have been glued together. As long as the planks are a glue-less system, they can be reused. A laminate floor that has been installed with glue will most likely have to be replaced entirely; or at least up to a point where a seam can be covered with a transition molding. If the floor is an interlocking, glue-less system, take apart one row at a time, stack the pieces in order, and set each row into a separate pile. Use painters tape to make bundles and mark the row number on each to aid your memory, especially if the project is expected to last some time. Cut and remove any wet underlayment material from the area. For glue-down wood flooring, use a circular saw to cut out the damaged area, leaving a 1” – 2” wide strip of plank around the perimeter when cutting parallel to the joint. Make sure to adjust the blade on the saw so that it cuts through the plank, but does not bite into the subfloor. Remove the planks within the cut area using a pry-bar, chisel, and a hammer. Because the pattern on a floor is staggered, you will need to carefully chisel out each plank that extends beyond the water-damaged area, and this is a sensitive operation. In most cases, you can make an absolutely straight perpendicular cut, and make a repair joint instead of chiseling out very long planks. A little caulking will hide this. See the illustration for reference. Using a very sharp chisel and a pry-bar, pull the remaining strips of plank from the joints around the damaged area. If the joints do not come loose on their own as you pry them away, you will need to use the chisel to cut all the way through the plank at the joint. This will cut each tongue from the tongue-and-groove system from all of the planks around the area that is to be repaired, allowing these to be removed. Be careful, and try not to damage the adjacent good planks. Chisel away as much of the damaged planks as is necessary to prevent damage to the edge of the adjacent good plank. Then use a pry-bar, hammer, and chisel to remove the remaining wood, and to clean out the joint from any material left in it. Scrape the glue residue away from the subfloor. If the damaged area is very large, consider replacing the entire floor, as chiseling planks out is tedious and difficult. Once the damaged materials are removed and the subfloor is exposed, measure the subfloor with a moisture meter, or use a calcium-chloride test to make sure that the moisture levels are acceptable. 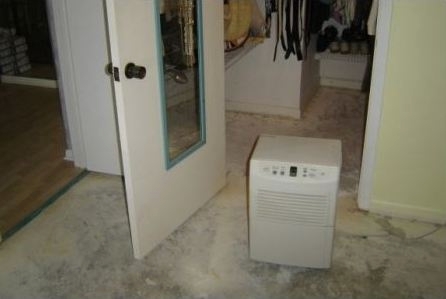 If necessary, run a dehumidifier at alternating locations within the area to speed up the drying process. If the project is not pressed for time, the area will also dry on its own, though much slower than with the help of a dehumidifier. When the subfloor is dry, then the new flooring material can be installed. Do make sure, however, that the subfloor is sufficiently dry before installing new material, as excess moisture can cause water damage to recur in the repaired area of the floor.